Is Ian the Best Companion in Fallout 1? For me at least, he is. Ian is a short, well built, former Crimson Caravan guard, never seen without his favourite Leather Jacket and Blue Jeans. Ian's days with the Caravan ended while being shot in a bandit raid, landing him in Shady Sands. After stumbling in for recovery, he felt he had a debt to pay and remained there to help protect the village from raiders. 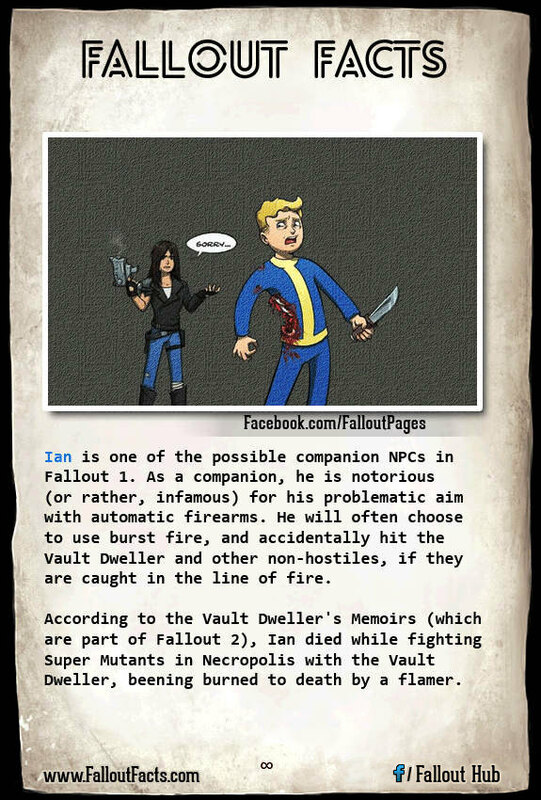 According to Fallout 2's “Official Game Manual”, Ian died while fighting against super mutants in Necropolis (accompanied by the Vault Dweller). Tragically, instead of a quick, painless death, the former Crimson Caravan guard died via flamer, going down in flames so to speak. Originally, before being cut from Fallout 2 during development, Ian had somehow survived the scorching, and had made his way to Vault City, changing his name to Old Joe. While not much is known about him during this time period in development, dialogue does reveal some secrets. 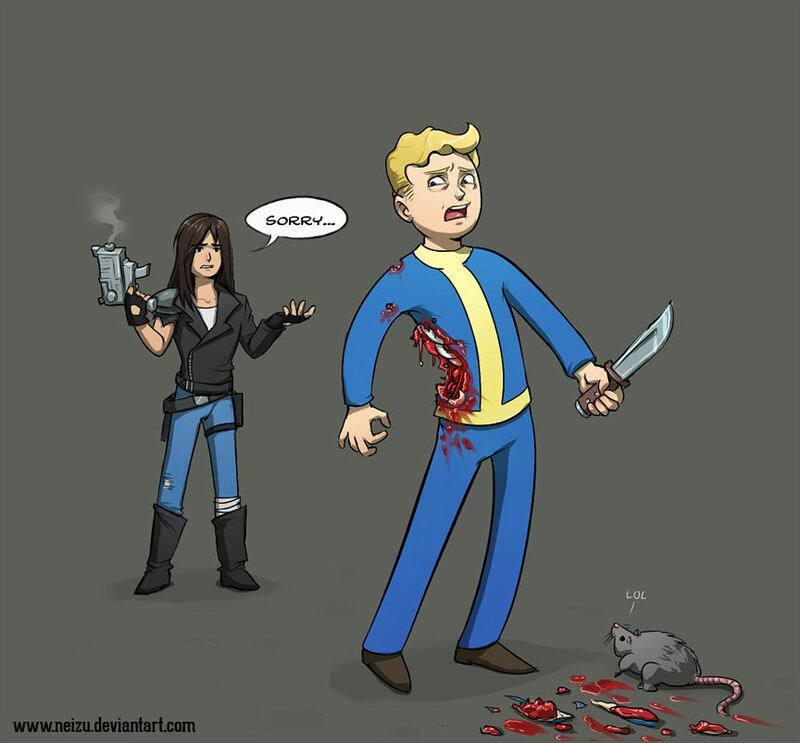 Ian would mistake the Chosen One for the Vault Dweller, and would go on to discuss events from the original Fallout before realizing he had the wrong man. Making a remark about the prejudiced nature of the Vault City's residents, he would give the Chosen One his old Colt 6520 10mm pistol, before sending him away, and telling the Chosen One to “make proud“ the memory of the long passed Vault Dweller. Watch out! While normally being a “good shot”, Ian can and will accidentally shoot you during battle, most often when using burst fire weapons. Whenever he rolls a 5 or below when shooting a ranged weapon, Ian accidentally hits a nearby random person instead - often an ally. Yeah, you. He can use knives, pistols, and SMGs. Ian is roughly based upon Ian Dunteman, the room-mate of designer Jess Heinig, although due to dialogue limitations, he wasn't able to quite express the full characteristics of the real-life Ian. Sorry ladies, it's implied that Ian is taken by someone “waiting for him back home”.